If the bugs return, so will we! No extra charge! Arrow Termite & Pest Control offers pest control services to eradicate termites, bugs and rodents for residential and business clients throughout the Southeast. The company additionally provides free inspection, cost estimation, commodity fumigation, bird control, lawn care and drain services. Arrow Termite & Pest Control provides trained pest control technicians specifically for servicing industrial, food preparation and warehousing facilities. Its clients include hospitals, nursing homes, food storage facilities, manufacturing plants and office buildings. 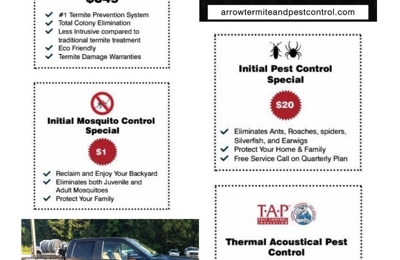 Arrow Termite & Pest Control provides protection, control and eradication services for roaches, water bugs, earwigs, moths, silverfish, crickets, ticks, squirrels, carpet beetles and wasps. It maintains a location in Baton Rouge, LA and locations all over Louisiana. From our humble beginnings, Arrow Termite and Pest Control arose to become the foremost choice in the eradication of all pests. The origins of the company began in Northern Louisiana in 1958 with the Cohn family. After growing up in the industry, Mike Cohn came to Baton Rouge in 1978 to start his own pest control company. Even with years of experience, starting a company from scratch comes with many challenges. Cohn started his business on commercial contracts with quality service and consumer satisfaction. With his mission, Arrow Termite and Pest Control grew into the premier termite and pest control company in the South for both commercial and residential properties. You'd better be home when they come to spray to make sure they're doing it. Arrow truck drove up my driveway and rang the doorbell. I was alone and did not answer the door. The exterminator went to his truck and wrote out my ticket, returned and slipped in my front door ... $79 and he did NOTHING. When I called the office to report the incident, the manager accused me of lying and said that if I did not pay, he'd turn me over to a collection agency. I paid the bill just because I didn't want it on my credit report. Disgusted and angry. 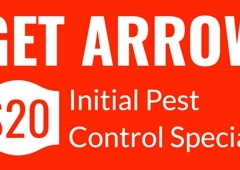 I have used Arrow pest control multiple times and each time have been very impressed with their company. They are very prompt, polite, professional and most importantly keep my house pest free! Definitely recommend Arrow to anyone with pest problems. I have my house under contract with them. I really like them because they have a ton of experience on their resume, they're locally owned and they're not all salesman like. I really appreciate the thorough pre-purchase home inspection. Arrow identified a major termite problem whereas another termite company told us the house was in fine condition. Go with arrow, they won't let you down! Super surprised by the review below... I had another company at my old house and they were average i guess and a little bit more expensive than arrow. Arrow did my termite pre-treatment at my new house and I was at first concerned. They came out and did a perimeter? treatment right after we moved in and gave me a sheet with tips on it on how I could help protect my home from termites. They also took care of my ant beds in the yard for free. I just started with their pest control service since their termite guy is awesome...and they were running a $20 special ha. Great local company for sure all the way around.